Hoi An has been trading with the outside world since almost the 15th century. Hoi An has been trading with the outside world since almost the 15th century. Once one of the busiest ports in all of South East Asia, the docksides of this relatively small central Vietnamese town were once awash with the sound of Chinese, Japanese, American, European and Indonesian traders, all bringing their wares to Vietnam’s doorstep. Warehouses strained under the weight of the orient’s finest silks and spices. Everything, from elephant tusks to beeswax, from paper to porcelain, was brought here and from here to the world. Hoi An still maintains a brisk trade with all its old business partners. However, it’s now Hoi An’s cash tills rather than its docks that ring to the sound of international commerce. Hoi An, with its traditional housing and narrow streets, all unspoilt by the passage of time, is a tourist mecca. Apart from the faces, little has changed in Hoi An since its commercial hey day. The nations of the globe still flock here, now to wander its ancient streets and marvel at a piece of Vietnam’s living history. Hoi An’s close relation to the rest of the world has worked to define the very bones of the town. Chinese and Japanese traders, particularly, extended their long stays in port to establish permanent agencies here from which to manage their trade. From these beginnings, sprang the first permanent Chinese settlement in Southern Vietnam, whose congregational assembly halls still draw both the descendants of those early Chinese traders and tourists alike. 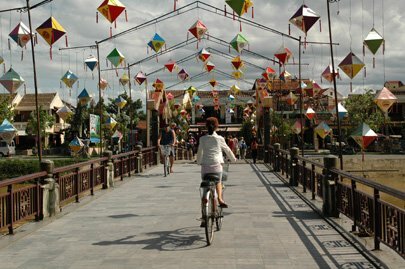 It was the links between Hoi An’s native Chinese and Japanese communities that was to give the town its most famous icon; the Japanese Covered Bridge. Built in the 1590s by the Japanese to connect them to their Chinese neighbours on the far side of the rivulet, The Japanese Covered Bridge has been drawing visitors ever since. Within its narrow walls, around halfway across, stands the temple of the northern God Tran Vo Bac De, critically for sailors, the God of weather. One legend about the bridge is that it as built to subdue the enormous ‘mamazu’ dragon monster, whose global reach stretched from its head in India to its tail in Japan, the movement of which was supposed to cause earthquakes. Vietnam, and principally Hoi An, was thought to sit across its back, so building the bridge at this spot would pin the Mamazu down and protect those the traders and settlers had left behind. However, Hoi An, and its surrounds, date back further than the international trade which later came to define the town. 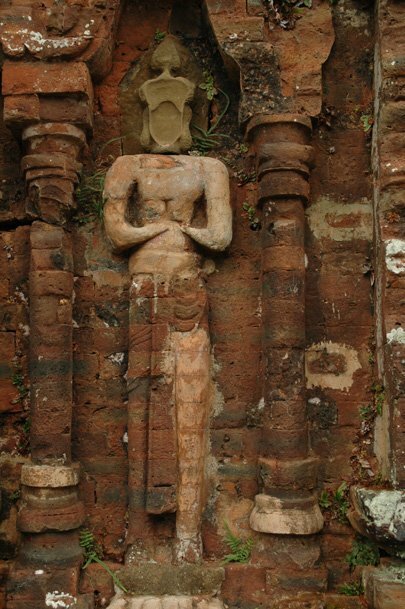 Around 55km outside of Hoi An’s centre can be found the ruins of My Son, once the political and religious centre of the Champa Kingdom. The Cham, who still exist within Vietnam today, once ruled the central provinces of modern Vietnam before being absorbed by the Vietnamese in around the 17th Century. My Son, the most significant and extensive Champa sites in Vietnam, dates back to the 4th -10th Century and its Indian influenced ruins are an easy motorbike ride away. Though it may seem suffocated by the sheer number of tourists who make their way here, Hoi An’ beauty - unspoilt by either time or war - still offers visitors a unique glimpse into Vietnam’s historic past. To walk Hoi An’s historic streets is to walk in the footsteps of those traders and merchants who built so much of this town and, in their own way, helped to shape the Vietnam of today.